HCM CITY – The HCM City Traffic Police Office will set up more traffic-police teams at traffic-jam hotspots and take random drug and alcohol tests of drivers in various areas in the city. HCM City has seven hotspots known for traffic congestion: Tôn Đức Thắng – Nguyễn Hữu Cảnh – Nguyễn Bỉnh Khiêm Junction in District 1; Cộng Hòa – Hòang Hoa Thám Junction in Tân Bình District; Trường Chinh Street in Tân Bình District; Xô Viết Nghệ Tĩnh Street in Bình Thạnh District; Dương Bá Trạc Street in District 8; Vĩnh Lộc – Nguyễn Thị Tú – Quách Điêu Junction in Bình Chánh District; and Bốn Xã Junction in Bình Tân District. 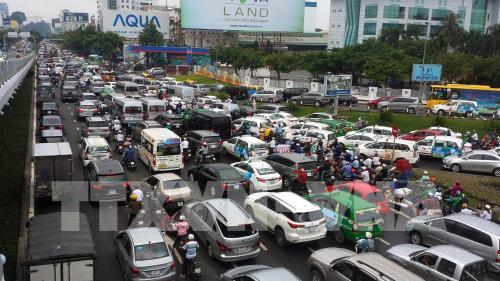 On April 1, thousands of vehicles and motorbikes were travelling in the hotspot area of Tôn Đức Thắng – Nguyễn Hữu Cảnh – Nguyễn Bỉnh Khiêm Junction. Four vehicles travelling on the Sài Gòn Bridge near the junction, which connects districts 1 and 2, were involved in an accident, which led to a traffic jam of more than two hours. Many people were late for work. Hùynh Hữu Nhân, a representative of Bến Thành Traffic Police Team, said the police teams began work on April 1 with related units such as the HCM City Youth Volunteer Force and district traffic police to set up a police presence at all hotspots. Besides traffic jams, road accidents are a serious problem in HCM City. Last year the city had a total of 3,618 traffic accidents in which 694 people died and 2,157 were injured. The city has 16 accident hotspots, which include National Highways No.1 and No. 22, Hà Nội Highway, and Nguyễn Văn Linh and Võ Văn Kiệt streets. These five hotspots are dense with heavy vehicles and motorbikes. The HCM City Traffic Police Office has set up a police team at these five hotspots in an aim to reduce the number of accidents. The Traffic Police Office will also periodically check management procedures, while inspection agencies will ensure that the teams are doing their jobs properly. HCM City has set a target of reducing the number of traffic accidents and casualties by 5-10 per cent a year in 2019 and 2020. To meet the target, the police force will focus on efforts to improve people’s awareness of traffic safety. The campaign includes year-long activities to raise public awareness about the importance of observing traffic laws on roads and in waterways. The city’s Traffic Safety Committee will also set up an inspection team to ensure that all transport operators are following traffic safety requirements and laws. Though city authorities have cracked down on overloaded cargo vehicles and unregistered buses, positive results have been modest. The city will also implement a programme to reduce traffic congestion and accidents by 2020. The programme comprises 97 projects, including the building of new roads and an improved public transport system. The 97 projects will cost a total of VNĐ96.159 trillion (US$4.12 billion), and will be mostly funded by the State, the city, and Official Development Assistance (ODA).